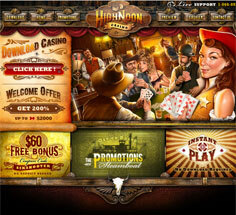 High Noon Casino lets players enjoy blackjack the way it was meant to be played – Wild West style! This is a themed casino, and the designers took everything to the max. 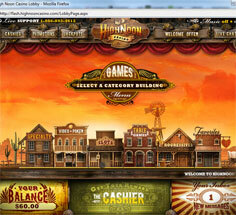 Every part of High Noon, from the website to the download software, is decked out in high-resolution Old West style graphics, giving the casino a very unique feel. Great games and a very hot bonus system make the site even more appealing. They even offer a $60 no-deposit bonus to all new players – good luck finding a deal like that in an Old West saloon! RealTime Gaming software powers High Noon Casino, and players can choose to either download the whole casino suite, or play a limited version instantly online. The full version and no-download versions look and work the same way, but the full download suite has quite a few more games available. 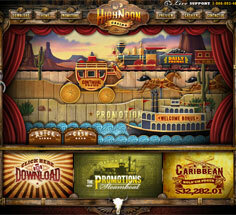 The casino software uses the same great Wild West theme as the High Noon Casino website, complete with an interactive promotions gallery and animated game menus. The download version installs in minutes, and is fun and easy to use. Blackjack is listed under Table Games, in a special section called “21 Games”. There are six great games to pick from: Blackjack, Blackjack and Perfect Pairs, Face Up 21, Match Play 21, Pontoon, and Super 21. The casino’s blackjack games are highly realistic, but they focus a bit more on smooth, fast gameplay than on pure realism. Chips and cards are easy to read, and controls are easy to use. A few user options let players turn off dealer voices and change the speed of the deal to suit their play preferences. More than 100 games grace the lobby of High Noon Casino, giving players a great variety to choose from. Plenty of slots and video poker games offer quick wins, while more complex titles like Baccarat, Caribbean Hold Em, and Pai Gao Poker offer more ways to win. Ten different progressive jackpot titles offer big payout potential, and a nice range of Specialty games mix things up with titles like Sic Bo, Keno, and Craps. 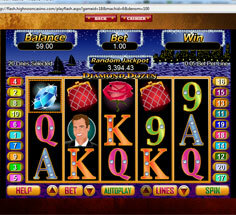 The quality of the games is generally excellent, even in the no download casino, and most titles can be played either for free or with real money. The bonuses at High Noon Casino are just as impressive as its Old West theme. Players can read all about them on the Promotions Steamboat, which offers an interactive way to explore all the benefits that this casino offers players. New members start off big, first with a free $60 no-deposit bonus, then with either a $2,000 slots bonus or a $500 blackjack bonus on their first deposit. Wagering requirements are a bit steep at 50x, but wagers on all blackjack games count 100%! Blackjachamp players get an exclusive offer of $60 free for new players , slots only. Please insert the code: SIXSHOOTER to claim it (50x Playthrough, Max Cash out is 5x the bonus). High Noon Casino has quite a lot going for it. First of all, it’s one of the best looking casinos that has been released in years, and even though it’s got a crazy Wild West theme, it still runs fast and smooth. Its bonuses are phenomenal, especially the free $60 no-deposit bonus and ongoing blackjack bonuses. The casino’s blackjack games are also excellent, even though there are only six of them. At the end of the day, High Noon Casino is an excellent spot for playing blackjack online.